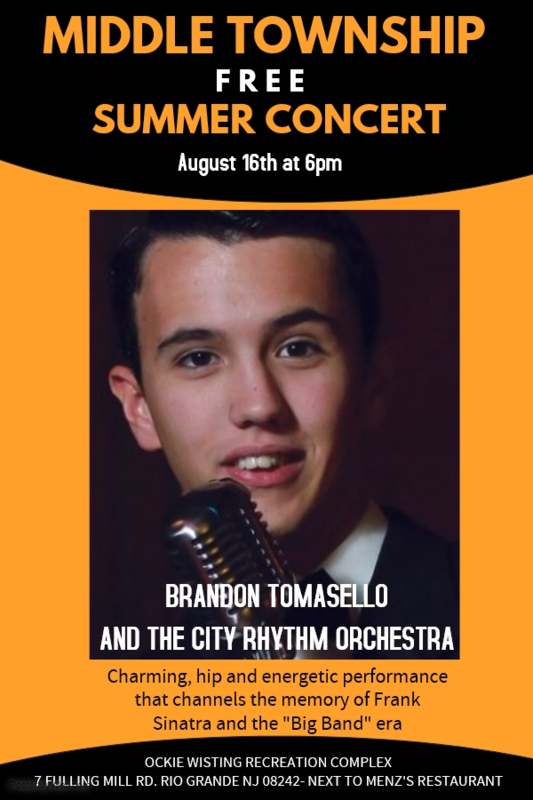 Middle Township’s second free summer concert features Brandon Tomasello and The City Rhythm Orchestra on Thursday August 16th from 6 to 8 pm at the Ockie Wisting Recreation Complex, 7 Fulling Mill Road, Rio Grande. 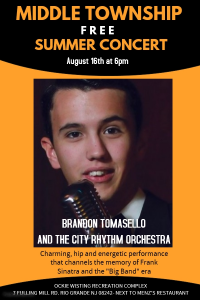 Brandon Tomasello and The City Rhythm Orchestra, a 16 piece band that gives a hip and energetic performance that channels the memory of Frank Sinatra and the “Big Band” Era. Alongside some great music, you can enjoy Spanish food from Pequita’s Dogs and Catering, festival food from Wild Dogs and ice cream from Mr. Softee. A great show for all generations. This is a great opportunity to come out and experience the new recreation complex. Bring your beach chair and enjoy a night of “Big music! !